A sharp rise in burial costs has seen an increase in number of paupers’ funerals held in Wealden, councillors heard at a meeting today. Paupers’ funerals – officially known as public health funerals – are council-funded services held when the deceased’s family either cannot be found or are unable to meet the burial costs. According to a report considered by the authority’s overview and scrutiny committee on Monday (November 12), Wealden District Council organised and paid for 16 such funerals last year. Asked how this figure compared to previous years, council officer Catherine Beaumont said: “We certainly have noticed, over the last five or six years, a gradual increase in the number of these public health funerals. “Basically this is because the cost of funerals in general have tripled in cost. So what is happening is that people are struggling with even doing a basic funeral. According to the report, the council-funded funerals this year included a service for an unidentified woman found dead at Cuckmere Haven, which was attended by more than 100 people in September. Many of the mourners signed a book of condolences on the day, which has been set aside in case the woman’s family is ever identified. 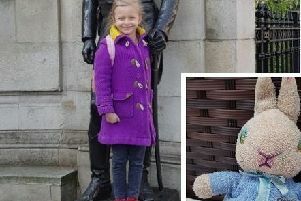 Sussex Police had sought to identify the woman for more than a year before the funeral took place. She was thought to be aged between 25 and 55 was found wearing two necklaces; a white metal chain and a dark metal chain with a floral leaf design pendant. Speaking earlier this year, Detective Sergeant Tod Stewart said: “We believe the necklace is very distinctive and could be an antique, this could be vital information which could help her being identified. “We don’t believe she is local as she matches no missing person descriptions; however, she could be from anywhere in the country or indeed, the world. Anyone who recognises the woman is asked to contact police online quoting serial 604 of 04/07/17 or speak with the UK Missing Persons Unit. Nationally, the number of paupers’ funerals has risen by more than 12 per cent between 2011 and 2016, according to a study published by insurance firm Royal London earlier this year. The study, which saw the insurance firm submit Freedom of Information requests to 390 local authorities, put the cost of these funerals at more than £4m during the same time period.